Agriculture provides the main support for Zambia’s rural economy, and because of this, growth in the agricultural sector is the clearest avenue through which poverty reduction can be achieved in Zambia. Sixty seven percent of the Zambian population depend on agriculture, primarily through smallholder production for their livelihoods and employment. Zambia recognizes agriculture as one of the key priority sectors in achieving sustainable economic growth and diversification away from copper mining. The Food Reserve Agency -FRA- recently made a decision to set the floor price of a 50 Kilogram bag of white maize at 60 Kwacha under the 2017 crop marketing exercise. The FRA further announced that it will restrict its grain purchase to 500,000 metric tonnes of grain as National Strategic Reserve (NSR) in line with Government policy guidelines and will no longer sell grain to millers who will be expected to buy their own grain. However, the FRA will enhance community sales and sell to vulnerable communities and favour programmes such as Disaster Management and Mitigation Unit, Correctional Facilities, Ministry of Education -home grown school feeding programme and hospitals. The FRA’s original mandate was to establish and administer a national food reserve alongside private grain trade and to serve as a buffer stock to cushion grain price variability and provide liquidity in the grain market. Over the last two decades the FRA has engaged more actively in the market by exceeding its prescribed target, and has often bought more than double the prescribed quantity. In particular FRA usually buys above the market price for maize; and then sells maize to the millers at a subsidized rate. This FRA activity in maize marketing in Zambia is partly because of the Government’s desire to resolve the “food price dilemma” by ensuring that maize producers get a higher price, on the one hand while maintaining mealie meal prices at affordable levels for consumers, and particularly the vulnerable households. A floor price is the lowest legal price a commodity can be sold at. Price floors are used by the government to prevent prices from being too low. Price floors are often used in agriculture to try to protect farmers. For a floor price to be effective, it must be set above the equilibrium price. If it’s not above equilibrium, then the market won’t sell below equilibrium and the floor price will be irrelevant. In the case of maize in Zambia the floor price is raised above the price set at equilibrium, so the demanders (consumers) aren’t willing to buy as much quantity. The demanders will purchase the quantity where the quantity demanded is equal to the price floor, while on the other hand, since the price is higher than what it would be at equilibrium, the suppliers (producers) are willing to supply more than the equilibrium quantity. Buy up all the surplus and sell it at a cheaper price. This often lead to subsidization of millers and re-sellers who do not pass on the full benefit of this subsidy. Government can strictly enforce the floor price and let the surplus go to waste. This means that the suppliers that are able to sell their goods are better off while those who can’t sell theirs (because of lack of demand) will be worse off. The Government can control how much is produced. To prevent too many suppliers from producing, the Government can give out production rights or pay people not to produce. Giving out production rights will lead to lobbying for the lucrative rights. If the Government pays people not to produce, this might create an influx of producers demanding to be paid. In the end, a floor price has negative impact on society more than it helps. It may help farmers, but it only helps those people by negatively impacting everyone else and causing deadweight welfare losses. Ministry of Agriculture budget allocations currently stand at 53.4% towards Farmer Input Support Programme, 17.3% towards Food Reserve Agency and 29.3% towards other expenditure. Given Zambia’s current fiscal position and widening budget deficit, PMRC recommends limiting FRA’s role to purchasing strategic reserves, and following prescribed quantities and areas of purchase. We further urge the government to strictly supervise and increase maize sales to rural communities as opposed to commercial millers in a bid to enhance activities of small scale millers in order to provide cheaper alternatives for these communities that are mainly characterized by poor households. Given the huge costs incurred by the government in subsidizing maize, it is prudent that government re-directs some of its efforts and resources from FRA to key drivers of growth in the agricultural sector that include livestock production, disease control measures, extension service and agricultural research and development. 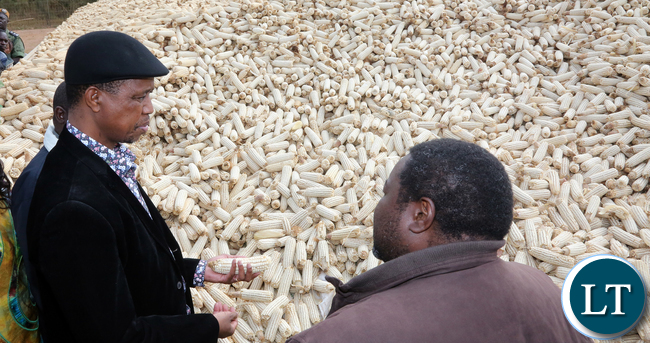 These measures should ultimately lead to de-regulation of the maize market, save government resources and enhance production in sectors of agriculture such as livestock and fisheries whose potential remains untapped and demand unmet by local producers. This policy should continue at all times – even when the nation has a drought situation. That will be the time farmers will make a killing for their efforts. I stopped a long time ago producing maize for human feed, all my maize is livestock feed. Ms Daka what exactly are you saying? Make it simple and straight forward- the Break-even price (what you are calling equilibrium) in reality is not K60 but as ZNFU have stated K75 for a 50kg white maize. As such it is only fair that the State increase this floor price of K60 to K75 for a 50kgbag of maize so that farmers can at the least recover what they have spent-failure to do so will result in a loss on the part of small scale farmers who are already economically vulnerable. Floor prices are in existence even in the more liberalised economies so let’s not discourage them as they pay a key role in supporting agric production. People should learn how to write. Place sub headings in your writing so people can follow your arguments. Don’t write like you’re writing a love letter. As far as I know, any College or University will teach you critical thinking skills and writing in the first semester. I’m not sure where you studied? Then comment on substantive issues which are the price of maize and Govt Subsidy? What point are you trying to put across? I am lost. Can someone summarize for me? It looks like a good article but to. ..especially without breaking into subtitles.